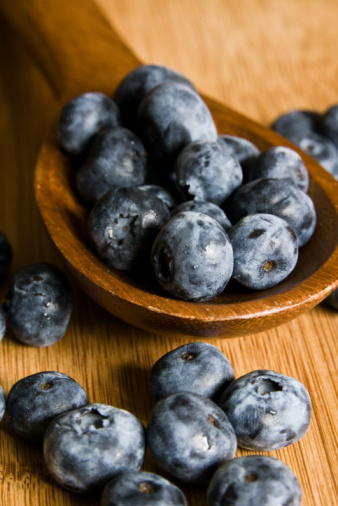 Blueberries get their dark blue color from the chemical peonidin, which is sensitive to the presence of acids and bases. This chemical belongs to a larger class of chemicals called anthocyanidins, most all of which are pH sensitive. Fresh blueberries can be used for a litmus test. In the presence of bases, anthocyanidins undergo a chemical reaction that alters which wavelengths of light they can absorb and reflect. In their natural state, anthocyanidins tend to be bright and colorful, but after reacting with bases, they lose that color and appear darker. Chop the blueberries into tiny pieces with the knife. The peonidin is primarily in the fruit's skin, so separating the inner pulp to retain the skin will produce better results. Add a small amount of water. High concentration is key, so try to use as little as possible. Boil the mixture of blueberries and water about five to 10 minutes. If it starts to dry up, add a little more water. Remove the mixture from the heat and allow it to cool. Pour the mash into the coffee filter and collect the liquid in the small jar. You may need to compress the filter gently with the spoon to get more liquid out of it. At this point, it mixture should be purplish red, similar to the color of strawberry syrup. Extract some of the liquid from the jar, using the eyedropper. Deposit a pool of the liquid about the size of a quarter onto a flat surface such as the saucer. Flush the eyedropper with water before using it to apply a few drops of vinegar to the mixture. The acid in the vinegar should turn the reddish purple to a lighter color, which would be more purely red or slightly pink. Rinse the saucer and repeat steps 5 and 6, but this time use laundry detergent instead of vinegar. Laundry detergent is a base, so it should turn the reddish solution purple or dark blue.